Draft Buzz: Could Paxton Lynch fall out of Round 1? Published: April 28, 2016 at 11:42 a.m. Updated: April 28, 2016 at 05:52 p.m.
Quarterbacks are the lifeblood of the NFL. If a team owns a franchise passer, the limits are boundless. If a team has squat under center, the search becomes all-consuming. With so many teams constantly spinning on the quarterback carousel, passers are at a premium. This year's free agency class of signal-callers was meager at best -- they almost always are -- which makes the draft the focal point in obtaining pigskin hurlers. The question: How many will be selected in the first round Thursday night? We know Jared Goff and Carson Wentz will go off the board at No. 1 and No. 2 overall (respectively). The question is when the next run happens. Will the Cleveland Browns take a swing at No. 8 or trade back to swipe one? How about the San Francisco 49ers at No. 7? What about the Buffalo Bills at 19, New York Jets at 20, Arizona Cardinals at 29 or Denver Broncos at 31? Any or all are in the market for a quarterback in this year's draft. Paxton Lynch seems to be the consensus No. 3 quarterback with some combination of Connor Cook and Christian Hackenberg getting first-round "buzz." It would be a shock if Lynch somehow fell out of the first round, but ESPN's Adam Schefter reported Thursday morning that it is "hard to find a landing sport" for the Memphis quarterback if Dallas doesn't trade back. In addition, NFL Media's James Palmer reported the Broncos think highly about Lynch, but it's unclear whether they would be willing to use their first-round pick on him. It's hard to fathom with all the QB-needy teams that Lynch will fall completely out of the first round. At the very least, a team high in the second round with quarterback problems could leap into the end of the first round (that fifth-year option could be big for a player like Lynch, who might need a year or two to groom). It's far easier to envision teams stretching for the likes of Cook and Hackenberg than Lynch falling out of Thursday's proceedings. 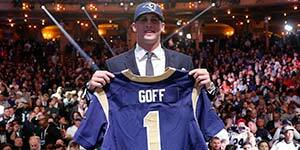 Over the previous 15 drafts, nine times at least three quarterbacks were taken in the first round. On four occasions, four signal-callers were snagged in the first round. Just four times in that span have only two quarterbacks been taken. Twice in the last 15 years one was selected (Mike Vick, 2001; EJ Manuel, 2013). NFL Media draft analyst Daniel Jeremiah has Lynch falling out of the first round in his final mock draft. Lynch's potential fall isn't the only quarterback buzz that Schefter noted Thursday morning. The intrepid reporter said Dak Prescott is one signal-caller who is likely to go higher than people expect. Clearly "higher than people expect" is a matter of perspective. NFL.com draft analyst Chad Reuter has Prescott slated to the Broncos in the third round in his seven-round mock draft. Could Prescott be pushed even higher into the second round come Friday night? 1. The Browns have already made one blockbuster draft trade, but is Sashi Brown not finished wheeling and dealing? Cleveland, currently in the No. 8 spot after trading its No. 2 pick to the Eagles, would have to be wowed to move down even further. Rapport reported Thursday the Browns have spoken with teams about moving back into the first round. "The phones are ringing right now upstairs, so someone thinks maybe they can talk them out of it," NFL Media's Aditi Kinkhabwala said. "They are answering the phone, but Sashi Brown just told me that someone would need to knock his socks off, and his socks are still on." If the Browns decide to part ways with their No. 8 pick, they could eye Mississippi wide receiver Laquon Treadwell further down the order, according to NFL Media Insider Ian Rapoport. The Browns also have a chance to trade up, as they have a multitude of picks outside of the first round, including the No. 32 selection. But Brown thinks he can get one of his guys by standing pat with the first pick in the second round. "I don't think we would have to move up from 32 to get any player that we'd be interested in taking," Brown told ESPN's Josina Anderson. "... I don't anticipate or plan to move off 32 to go get a quarterback." 2. The Cowboys will be drafting a new player early Thursday night, as Dallas has the No. 4 pick. There are plenty of options to choose from, but it seems the locker room is leaning in one direction. "A lot of the players are hoping for Jalen Ramsey at No. 4 if he's still there," NFL Media's Stacey Dales reported. It's easy to see why the team wants Ramsey, especially after listening to his former coach list all of his strengths. "Highly intelligent, very smart, learns very well," Florida State coach Jimbo Fisher said. "That's why we were able to move him to so many different places. A lot of guys have the athletic ability but not the intelligence level of comprehending all that. Extremely athletic and at the same time physical, that's very rare for a corner." Another possibility, according to Rapoport is Ezekiel Elliott. 3. Ryan Kelly is the top-rated center on many draft boards. Most don't expect the Alabama product to slip to the back end of the draft. "No way he gets past 20 or so," one scout told The MMQB's Peter King. "He could go to the Colts at 18. Perfect fit for Andrew Luck for the next 10 years." 4. Be on the lookout for a Myles Jack free fall on Thursday. After acknowledging about the potential of microfracture surgery in the future, the former UCLA linebacker could remain on the board after the first 10 picks are in. Rapoport reported that Jack likely will fall out of the top 10, but he has a few potential intriguing landing spots in the teens, including the Dolphins and Raiders. 5. Will a safety be selected in the first round? Florida's Keanu Neal hopes so. He told ESPN that he "would love if I get a call from Atlanta." NFL Media's Daniel Jeremiah doesn't have Neal going to the Falcons at No. 17, but rather has the Jets taking the safety at No. 20 in his final mock draft. 6. Alabama linebacker Reggie Ragland was flagged for an enlarged aorta, Rapoport reported. His enlarged aorta will require yearly monitoring, according to people close to Ragland and officials with seven teams. According to the seven teams, the condition is not expected to alter his football career. However, he will need to monitor it closely. 7. Ohio State running back Ezekiel Elliott discussed the possibility of the Miami Dolphins trading up to draft him with ESPN's Josina Anderson. "I wouldn't be mad going to Miami," Elliott said according to Anderson. "It's not a bad place to go ... They do have a need for a running back. I do think it's a possibility that they will trade up, but I don't think any team will trade up until draft day or do anything crazy until they know for sure Dallas won't take me." Rapoport notes the Ravens could strongly consider taking Elliott if he's still available.